Here are five important questions to ask before investing in any church chair. The reality is that your new church chairs are going to be more utilized than all the other furniture in your church combined! If you have not noticed, when people attend church, they do like to be able to be seated for much of their time there. Therefore being certain to acquire church chairs that will provide comfort for at least 90 minutes is paramount. 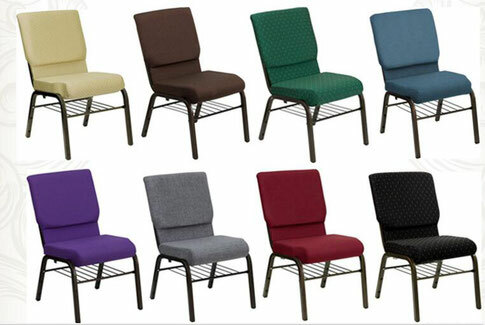 We regularly encourage churches to order sample chairs of all the worship seating that are on their short list. Once in your possession, don’t make the mistake of asking people to sit on each potential chair and immediately let you know which chair they think is most comfortable. A 60 second test and opinion is not going to be very accurate. Rather come up with opportunities to try out the sample church chair(s) for extended periods of time such as working at a desk, or watching television for an evening, or reading a book for an hour or two. Try to have as many people as possible do the same with each church chair you are considering. By following this simple process, your church will have a far more accurate result for whether or not each chair you are considering will actually be a comfortable chair for a normal worship service. In our present day it can be difficult to easily learn whether the church chairs you have samples of are produced by an “actual manufacturer” or a “pretend manufacturer”. What is the difference between these two types? In general, the answer is that an actual manufacturer has their own facilities that produce their chairs and they then provide those chairs to churches across the country through a distribution network. A pretend manufacturer though simply purchases container loads of church chairs from foreign factories and then advertise them to churches as their own chairs as if they produced them. With this latter scenario, issues like warranties being honored, the ability to order more chairs later, the option to customize your church chairs extensively, etc. all become very suspect. Our advice is to always verify that there is a true North American manufacturer who is producing and standing behind the church chairs (even if some of their production is overseas) you are considering and to avoid third-party pretend manufacturers. We find that often churches considering the purchase of new church chairs fail to request a warranty certificate in advance to examine. They simply hear the sales person tell them there is a 25 year warranty or a lifetime warranty and they accept that sales person’s statement. But if you obtain an actual copy of the warranty documentation you are able to see for yourself what the warranty really is or is not, what is covered and what is not covered, and how easy or difficult the warranty process is. Be sure to read all the “fine print” in the certificate. At times we have seen some clauses in church chair warranties render the warranty itself practically useless. We spoke with one church that found out that the church chairs they had purchased from a pretend manufacturer actually required the church to ship their chairs back to the importer so the importer could examine the chairs and determine if there was in fact a substantive warranty claim. The church did not do so as the cost to repackage and ship the chairs back, not to mention having to do without chairs for a significant period of time at their church, was absurdly prohibitive. We would venture to guess that no churches would ever be able to do so. So while a 25 year warranty theoretically existed, the reality is that in this case the warranty was essentially useless. You do not want your church to be surprised like this. We encourage you to request some actual cases of how the warranty being offered actually played out in a way that satisfied the churches involved. This is the question of course that all churches will be sure to ask as they are considering new church chairs. Churches have limited funds and the cost of the church chairs that are being considered is a key question. But it is also vital to balance the price with the fact that a quality church chair can be used for the next twenty years by your church. Twenty years contains over 1000 Sundays. We would suggest that if your church should spend ten dollars additional per chair to purchase church chairs with great quality (over an entry level church chair with far less quality and far less years of use) that additional investment will equate to less than once cent penny per Sunday for each chair. Our experience is that when a congregation becomes aware that for just a few more dollars per chair, they can obtain a church chair with greater comfort, better quality, and a meaningful warranty, most members of the congregation are more than willing to help make that happen. We encourage your to communicate this truth with your congregation and we believe you will have the same response from your people. What about your Unique Environment? The truth is that each church has their own unique DNA and as a result, the church chairs your church chooses will work best if they complement that unique DNA. If your setting requires that you stack and store your worship chairs often, there are chairs with attributes that will help that process go more smoothly and church chairs that will make it more difficult to carry out that process with. If your setting has limited storage and you need to store your chairs in that limited storage space at times, then worship seating with an efficient storage rating should be pursued. If the geographical setting of your church places you in a jurisdiction that requires stronger flammability certification for fabric and/or foam on your chairs, you will have your range of choices for worship seating restricted quite a bit. Therefore it makes sense to work with a church chair provider that has in their portfolio a bevy of worship seating options so that the best chairs for your unique DNA will be recommended. Too often we see church chair providers who have a limited portfolio seek to foist their chairs upon churches, even if it means fitting a square peg into a round hole. Working through the responses to these 5 questions early in your journey toward new church chairs will have a positive impact on the outcome of our church chair journey.